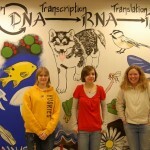 Want to get involved in one of the many great Biology-related student organizations on campus? Come to this event to hear about all of the different involvement opportunities available for Biology students and learn about the activities and benefits of each organization! Snacks and drinks will be provided. Not a registered organ donor? Stop by quickly and sign up! Good variety of used biology-related books including textbooks. Or else, just stop by to get some yummy baked goods! 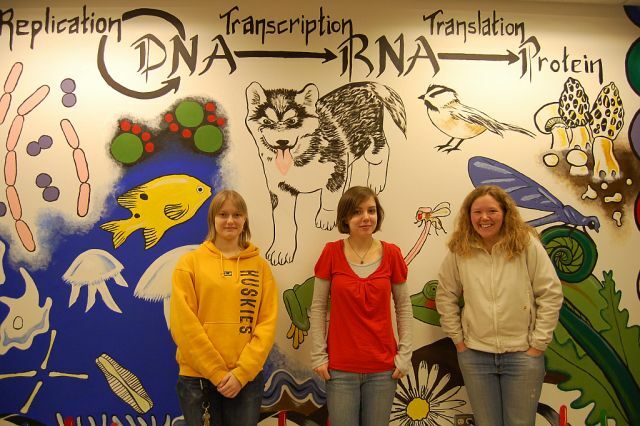 Curious about what research is conducted in the Biology Department? Come listen to professors from the department present on their research. Snacks and drinks will be provided. Hike with Phi Sigma and Outdoor Adventure Program to Hungarian Falls! Fee includes transportation and guides from Outdoor Adventure Program. Email aauhl@mtu.edu in order to reserve your spot. Many thanks to Shannon Gabel who designed and painted the mural. Thanks also to painting assistants Maija Stenvig, Mary Kennedy and Kevin Clover (not pictured). and four honorable mention awards were presented. The recipients were selected from among the 43 posters and abstracts submitted by students conducting research related to ecology, the environment and biotechnology at Michigan Tech.